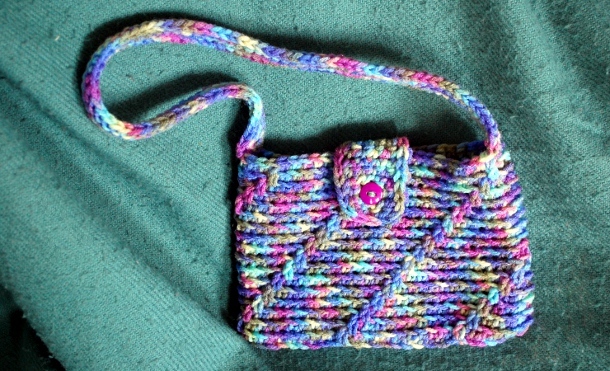 This little purse is just the right size for carrying a phone, wallet, and keys, with room for a little bit more. Worked in the round with a touch of texture, it is quick to finish and easy to personalize. 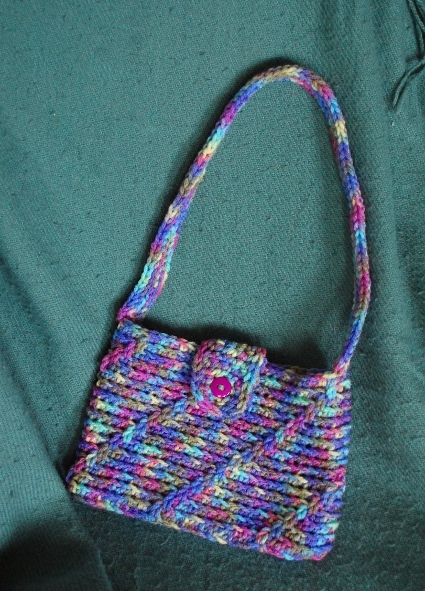 Try it with a self-striping yarn for a completely different effect! Gauge: 15 sts/12 rows = 4″ in patt. 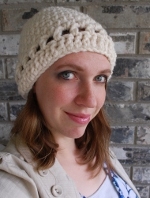 fldc (Front Loop Double Crochet) – double crochet through the front loop of the stitch one row below. Rnd 1: Ch 55; join in 1st chain to form ring. Ch 1, sc in each ch around. (55 sc) Join rnd. Rnd 2: Ch 1 and, working in the back loop only, sc in each st around. (55 sc) Join rnd. Rnd 3: Ch 1; working in BLO, sc 5. *Fldc, sc 10 in BLO. * Repeat from * to * until 6 remain. Fldc; sc to end of rnd. (55 sts) Join. Rnd 4: Ch 1; working in BLO, sc 6. *Fldc, sc 10 in BLO. * Repeat from * to * until 5 sts remain. Fldc; sc to end of rnd. (55 sts) Join. Rnd 5: Ch 1; working in BLO, sc 7. *Fldc, sc 10 in BLO. * Repeat from * to * until 4 sts remain. Fldc; sc to end of rnd. (55 sts) Join. Continue in patt. as established (bringing the last fldc from the end of the round around to the beginning of the round once it reaches the join) until piece measures 5.5 inches from beginning; finish off. Row 1: Ch 6. Sk 1 ch, sc in each of the next 5 ch. (5 sc) Turn. Rows 2-6: Ch 1; sc across. (5 sc) Turn. Row 7: Ch 1; sc in each of the next 2 sts. Ch 2, sk 1 sc, sc in each of the last 2 sts. Turn. Row 8: Ch 1; sc in each of the next 2 sts, sc in ch-sp, sc in each of the last 2 sts. (5 sc) Turn. Row 9: Ch 1; sc dec, sc in next st, sc dec. (3 sc). Sl st all the way around the edge; finish off. Row 1: Make a chain 22″ long. Turn. Row 2: Sl st in each ch across. Turn. Rows 3-6: Sl st in BLO across; turn. Turn bag wrong-side out; flatten with join at one edge. Sew Row 1 together, turn right-side out again. Sew flat edge of button flap to top edge of bag. Sew button to other side in the correct position. Sew strap to bag at top corners; weave in all ends.